The Mission of Reuther Central High School, a safe and caring learning community, is to inspire students to graduate and become productive members of society, by supporting them to create and pursue their dreams. Blended Learning will provide classes that are different than the traditional lecture and homework courses. This model will provide each student a chance to work on their curriculum at their level and at their pace. Each student will be reviewed based on their credit needs and given a schedule that supports their work toward graduation. Blended Learning uses a combination of online class work (done in class or at home) with face to face instruction by the teacher. All courses are regular KUSD courses, and your child would earn the same diploma as they would at any other high school in the district. The Kenosha Unified School District has developed requirements for the issuance of an Equivalency KUSD high School Diploma for eligible students. An adult program for all 18 year old students is housed at Reuther High School. Eligible students, (1) are/will be 18 before the next test date, (2) are a resident of the Kenosha Unified School District, and (3) are a member of a District cohort group. Reuther students who are 17 in the quarter of the test during their senior cohort year may also be eligible for this option. To pursue this diploma option, students must complete an employability component and a writing component, and they must have earned credit in the following course: Personal Finance/Economics, Health, and Government and Politics. If eligible students pass the ITED Test and complete all other requirements, they will graduate with an Equivalency KUSD High School Diploma and be allowed to participate in the Equivalency Diploma graduation ceremony. You should be aware that the Equivalency KUSD High School Diploma might not be acceptable for entry into all institutions of higher education or all branches of the military. It is accepted by all local colleges. You should also understand that some apprenticeship programs will not accept an Equivalency Diploma. It is the responsibility of the student to determine whether or not his/her future plans will be adversely affected by choosing an Equivalency Diploma option. The Transition Program is designed to reengage struggling regular education students. It targets students with health issues that have prevented them from attending a traditional high school program. Homebound students may be placed in Transition prior to being returned to a tradition schedule. Transition provided a curriculum that allows student to earn credits at an accelerated pace. Kenosha Unified Schools rank students using two parallel methods. Both appear on the transcript and are used for college applications. The first is the “Traditional Method” of counting all A’s = 4 points, B’s = 3 points, C’s = 2 points, D’s = 1 point, and F’s = 0 points. This calculation places equal value on all courses. The cumulative grade point average result is placed on the transcript each year and a class ranking developed from the cumulative grade point average for a student at each grade level listed. The second method gives differing values to honors classes, regular classes and basic classes. Grade point average on the weighted scale is computed and placed on the transcript with the rank developed from using these “honors” grade point averages in the same manner as using the Traditional Method. All students are evaluated and ranked in two separate ways. The weighted approach gives greater value to more difficult and demanding honors courses and thus a student with honors courses ranked on the weighted scale will rank higher. The traditional 4.0 evaluation gives equal value to all courses regardless of difficulty. These two methods allow for two perspectives on student achievement. Quarterly rolls are calculated using both the traditional 4.0 grade point scale and the weighted grade point scale. Students with a grade point average of at least 3.0 on the 4.0 scale or 4.3 on the weighted scale achieve honor roll status if they do not receive a grade lower than a C.
Grade point averages (GPA) and class ranks are calculated on both scales only at the end of each semester. Both grade point averages and class ranks appear on student transcripts. Reuther students must use the North or West stairs when entering the second floor of the building. Students are not allowed to use the East stairs when entering the second floor. attend classes regularly, complete assignments, and behave appropriately. be respectful of the rights of others. be in class on time. Loitering in the halls is not tolerated. Passing time must be completed within the allotted 3 minutes. A bell will sound to indicate the beginning and end of a class period. complete their own work with honesty and integrity. wear their ID’s at all times. obey all state and local laws. Possession and/or use of weapons, explosive or incendiary devices, pepper spray, gang activities, possession or sale of illegal substances, assault or harassment, theft, battery, setting off fire alarms falsely and all other violations of the law is cause for arrest by the Kenosha Police Department or Village of Pleasant Prairie Police Department. not smoke in the building or on school property. leave jackets, hats and gloves in their lockers. These items may not be worn in school. No chains are permitted. keep the building neat and quiet. No food should be carried into academic areas without prearranged permission. use appropriate language. Profanity is not tolerated. refrain from public displays of affection. Anything beyond holding hands is out of place and is not allowed. follow bus regulations, if a bus rider. follow attendance procedures for illness, prearranged absences and signing out of the building. keep all cell phones and other electronic devices off and out of sight during school hours unless authorized by a principal/designee; use beyond the school day may be monitored by the principal /designee. Electronic and laser light devices to school are prohibited. Beepers and cellular picture phones are not allowed in school by Wisconsin State Law. leave the building within 15 minutes of the final bell unless under the direct supervision of a teacher or an adult advisor. The Kenosha Unified School District holds respectful behaviors among all individuals paramount. For individuals that make decisions which go against our expectation for respectful behavior, a number of pursuits are employed to create a teachable moment. Each program supports students in areas of concern for the student in unique ways depending on their program design and structure. Common interventions include student conferences, parent conferences, and referral to support staff or administration. Students may meet with teachers, support staff (dean, counselor, social worker) and administration to learn strategies for maintaining respectful behavior while dealing with everyday problems. Support staff may recommend community services to assist the student or family outside of school. A Student Intervention Team made up of our support staff, teacher representatives and administration is available to review concerns and make recommendations for chronic or severe student problems that do not respond to other interventions. In some cases, students may change programs/schools within Reuther as an intervention. While these steps are progressive, some behaviors may warrant steps to be skipped/escalated based upon school or district policy or procedures. School Administration reserves the right to remove a student from any or all of the following privileges to preserve the integrity of our School Pride. At all times, we intend to behave with dignity and respect as a KUSD Community. Because we care for each other as a team, we assist those that may slip from expected respectful behaviors. The goal is to provide opportunities to learn from mistakes and take meaning from the renewed pursuit of respectful behaviors. WHEN A STUDENT IS ABSENT FROM SCHOOL. THE STUDENTS PARENTS OR GUARDIAN MUST CALL THE SCHOOLS OFFICE TO INFORM THE SCHOOL OF THE REASON FOR THE ABSENCE. Reasons for excused absence include: personal illness, family emergency, death in the immediate family, medical or dental appointments, and when approved in advance by a principal or school official. Students are expected to attend classes regularly, during the full periods and hours that the school is in session, in accordance with Wisconsin Statutes. Any absences not excused per above reasons, students are considered truant.Many students who miss school frequently experience great difficulty in achieving maximum benefits of schooling. Truancy from class could result in a contract violation. When a student is absent from school the student’s parents or guardian must call the office between the hours of 7:00 AM and 6:00 PM. In order to keep our excused absence list as accurate as possible, a call should be made each day of and extended absence. If, due to extenuating circumstances, a phone call cannot be made within 24 hours of the date of the absence, a note indicating the date of and the reason for an absence must be sent to school and approval received by the principal or designee. Any absence not cleared within five (5) school days will stand truant. It should be noted that students who are absent from school due to illness and observed later in the day on a job site or at an after school activity will be marked truant for the day. If the student is too ill to be in school, he/she is considered too ill to be on a job or participating in school activity. Transportation problems are not recognized as valid reasons to be absent from school all day. Legitimate transportation problems, when not excessive in number, could be an excusable reason for arriving late to school but not to miss the entire day. It is an expectation that all building administrators will follow District guidelines for addressing students who are truant. Interventions for truancy will include calls and letters to notify the parent/guardian of a truancy problem, opportunities to meet with the student and with the parent/guardian to discuss a student’s educational program and other plans to assist the student. Reuther Central High School’s faculty and staff are dedicated to assisting students in being successful in school. School attendance is key to our efforts. Habitual truancy means that a student has been absent from school without an acceptable excuse for part or all of five or more days on which school has been held during a school semester. (Truancy is defined as provided in Board Policy 5310). Any student arriving late to school must check in at the Main Office. The Attendance Officer will determine whether the tardiness is excused. Unexcused tardiness may revert to a half-day truancy depending on the arrival time of the student and the program the student is enrolled in. Students are expected to be on time to school. dates, and family vacation must be pre-arranged in advance of the absence. Arrangements for an absence of less than one day may be made by bringing a note, which states the reason for the absence, to the Main Office prior to the absence. Students leaving the building must sign out in the Main Office and present the approved note. Students returning to school must sign back in at the Main Office prior to returning to class. Requests for absences of a whole day or longer must be submitted on the Pre-Arranged Absence formwhich is available in the Main Office. Requests must be submitted at least five (5) school days prior to the date of absence. Students (and others) who have been informed not to be on or in school property or who have no permission or authorization to be on or in school property may be issued a ticket for trespassing. The Nurses Office is available during various school hours. The nurse’s duty is to maintain and promote good health. The nurse will give advice regarding health problems and care for emergencies, accidents, or sudden illness. No drugs of any type, including aspirin, can be given to students by the nurse, or by any other school personnel. However, when medication is required during the school day obtain an A Request for Medication Administration During School Hours form from the Main Office. If the Nurse is not available students report to the main office. So that parents may be contacted regarding their child’s illness, it is imperative that students complete their student health and emergency information cards. low annual premium for those who desire to participate. Information on this insurance program is provided to every student at the beginning of the school year. All students in grades PK through 12 are to remain on campus during the school day. Students will not be permitted to leave the school or engage in non-school related activities during the school day without the permission of the principal or designee and a parent/guardian. Eating during the noon hours is only allowed in the cafeteria. Food may not be eaten in the hallways, on the stairways, or in the areas in the front or on the side of school. Bag lunches brought from home are to eaten in the cafeteria. Each student will be expected to observe the few simple guidelines that are established to provide sanitary conditions during the lunch period. Students are responsible for disposing of their own refuse and returning trays to their proper place. Each student should develop eating habits that are conducive to keeping the cafeteria neat and clean. If food is accidentally dropped on the floor, the student is expected to pick up this food and place it in the waste container. Whoever willfully, knowingly and without authorization does any of the following may be penalized by the school, which may include suspension or recommendation for Administrative Review for expulsion. Hacking and Other Computer Data Crimes. Modifies data, computer programs or supporting documentation. Destroys data, computer programs or supporting documentation. Accesses data, computer programs or supporting documentation. Takes possession of data, computer programs or supporting documentation. Copies data, computer programs or supporting documentation. Discloses restricted access codes or other restricted access information to unauthorized person. on an electronic mail or other computerized communication system with the reasonable expectation that the person will receive the messages. With intent to harass or annoy another person, sends a message to the person on an electronic mail or other computerized communication system while intentionally preventing or attempting to prevent the disclosure of his or her own identity. While intentionally preventing or attempting to prevent the disclosure of his or her identity and with intent to harass or annoy another person, sends a message on an electronic mail or other computerized communication system with the reasonable expectation that the person will receive the message. Knowingly permits or directs another person to send a message prohibited by this section from any computer terminal or other device that is used to send messages on an electronic mail or other computerized communication system and that is under his or her control. There is no reasonable expectation of privacy when using school district computers. All school district computers and data contained on them are the property of the school district. Computer use, including e-mails, may be monitored by the school district. Any page design which is determined to have deleterious effect on the school and/or students will not be permitted. Any student engaging in web page design to cause a deleterious effect on the school and/or student will be subject to disciplinary consequences. All students are expected to exemplify appropriate hygiene and dress standards in a manner that projects an appropriate image for the student, school, and District. The District shall not require specific brands of clothing. No student shall be permitted to wear any clothing which is normally identified with a gang or gang-related activity (including gang-related colors if for purposes of gang identification), or clothing that contains pictures and/or writing referring to alcoholic beverages, tobacco products, sexual references, profanity, illegal drugs, bigoted epithets, harassment/hate messages, or messages of hostility toward race, ethnicity, religion, or sexual orientation. If there is a disagreement between students and/or parents and the staff regarding the appropriateness of clothing, the principal will make the final determination. Must be clean and in appropriate repair, holes and rips, below mid-thigh are permissible but rips or holes above mid-thigh must not show skin. All students must pay their fees and take care of all financial and other obligations (library fines, the cost of replacing books, etc.) incurred while in attendance at Reuther. Seniors should have all these obligations met prior to graduation day or they will not receive their diploma. Once financial obligations are met the diploma will be awarded. Final exams will be given in all classrooms. The final examination will be comprehensive and cover the entire quarters material. Students will be expected to clear up all fines before taking final exams. All final exams will be weighted 20%. A final examination schedule will be published and followed. All students will be expected to take final exams at the scheduled time unless the student has an excused absence. Failure of a student to take the final exam will result in a failure for the course. Fire drills are required by statute at least once per month unless weather conditions endanger the health of the students. When the fire sounds students should move quickly away from the building until the exit is clear and the last to leave are at a sage distance. A signal will be sounded signifying that the alert is over. Fire alarm exit cards are placed in every room signifying the exit to be used. Each student will be assigned their own locker each school year. Some students will be eligible for free or reduced lunch, dependent upon Federal guidelines. Application is made at the beginning of the year using forms available in the Main Office. Approved applications abusing the free or reduced price ticket privilege (for example, giving or selling them to friends) will have their privilege revoked. Student I.D. cards will be required in order to participate in the lunch program. All enrolled students of Reuther High School are eligible to receive a healthy breakfast and lunch at no charge to your household each day of the 2014-2015 school year. No further action is required. Students will be able to participate in the breakfast and lunch meal programs without having to pay a fee or submit an application. For a student to have a” free” meal, the meal must be a COMPLETE meal. A complete meal consists of at least 3 out of 5 items. A fruit or vegetable must be included at lunch. A fruit or fruit juice must be included at breakfast. Students must choose at least 1 fruit or 1 vegetable. Milk is a choice and is not mandatory. Students will be required to have a parking permit displayed. There is a $50.00 parking permit fee. Passing time is to be used appropriately; going to lockers and restrooms. It is the student’s responsibility to return to class on time. If they do not return on time they are violating their contract. Student and parental privacy rights shall be respected in all classrooms, group counseling, group guidance, and other student activities. No student shall be required, without the written and informed consent of parents or legal guardians, to participate in any group activities, exercises, or studies intended to reveal personal or family information. Mental or psychological problems potentially embarrassing to the student or his/her family. Appraisals critical of oneself or of others. The provisions of this policy do not apply to written surveys or questionnaires approved by the principal and the Superintendent of Schools in which the student respondent is not identified with the responses and where the purposes are ethical and constructive. Excessive physical demonstrations of affection are inappropriate on school grounds and at school activities. They are a distraction from an educational school setting. Repeated violations will be addressed by a call to the parent/guardian and possibly suspension. If there is a question whether or not schools will be in session because of inclement weather, do not call Reuther High School for that information. Instead, listen to radio stations WLIP-1050 AM, WEXT-104.7 FM, WGTD-91.1 FM, or television cable channels 20 and 39, which will broadcast closing announcements. If no announcement is made, school will be open for classes as usual. The determination to close schools is made by the Superintendent of Schools, not the individual schools administrators. The Superintendents office will notify the radio and television stations. Use the radio/television then as your primary source of this information. Make-up days: In the event school is closed due to inclement weather or other emergencies, the day(s) shall be made up at the end of the regularly scheduled calendar negotiated by the Board of Education. No one other than parent(s), guardian(s), and community service personnel will be permitted to contact students during the school day. These persons are to report to the Main Office. Reuther wishes to maintain a positive and safe learning environment. During severe weather and tornado situations, a public address announcement will inform you to “take cover.” Everyone is required to report to designated areas as noted on room posters until an all clear signal or announcement is made. Students are prohibited from smoking in school and/or school grounds at anytime. The police department will ticket in addition to facing consequences from the school students. 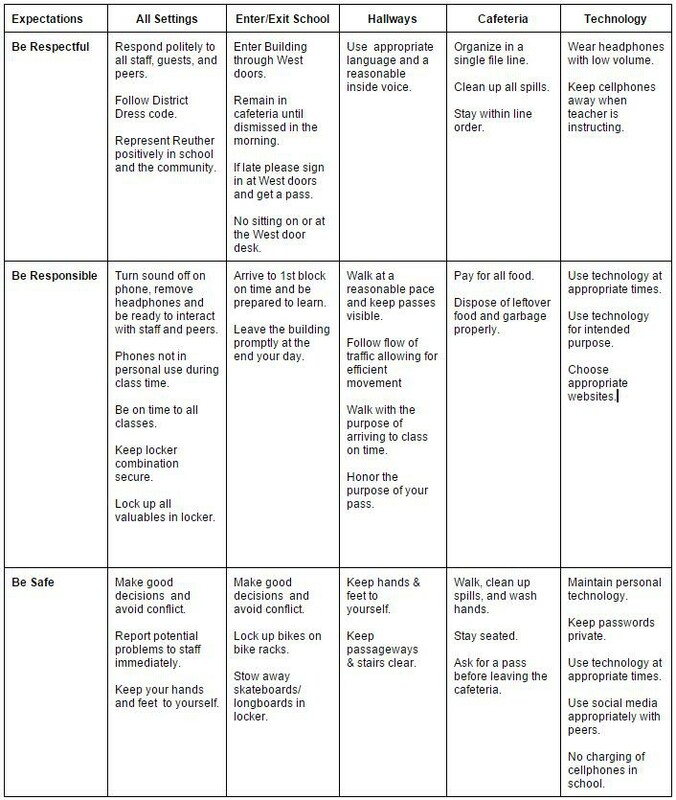 Periodically students will be required to participate in a school safety drill. Faculty will be advised over the intercom for procedures that must be followed. Students are reminded to take these drills seriously. Each student is issued a picture identification card at the beginning of the school year. This identification card establishes the student’s rights to be in the building and attend school activities. A student should have this identification card in his/her possession at all times. In order to participate in the lunch program students will be required to have an I.D. card. The telephones in the Main Office, Guidance, and in teacher’s classrooms are for staff use only. Only when there is an emergency, such as illness or accident, will a student be allowed to use school phones and then the call must be made in the Main Office. Only when there is an emergency requiring the immediate attention of a student will messages be accepted in the Main Office. Students will not be excused from classes to make ordinary phone calls or to receive phone calls. Unauthorized publications will not be distributed in the school building, on school grounds, on the school buses, or at a school-scheduled activity. School time will not be used to work on unauthorized publications. School equipment and supplies cannot be used to unauthorized publications. Students are not to bring visitors or out-of-town guests or relatives to school to attend classes. No visitor passes will be issued. Parents/legal guardians, however, are always welcome. The only exception to the no student visitor is that we will allow a prospective student to visit Reuther is when he/she is seriously thinking about enrolling in the near future. The request to visit must be made by the visiting student’s parent in writing and must have prior approval of a principal. Dangerous Weapon – Includes: firearm (loaded or unloaded); electric weapon or other device designed as a weapon and capable of producing death or great bodily harm; metallic knuckles or knuckles of any other substance which could be put to the same use with the same or similar effect as metallic knuckles; nanchaku or any similar weapon consisting of two sticks of wood, plastic or metal connected at one end of a length of rope, wire, chain or leather, cestus or similar material weighted with metal or other substance and worn on the hand; shuriken or any similar pointed star-like object intended to injure a person when thrown; or a manrikigusari or similar length or chain having weighted end. The teacher and student will make every effort to resolve the problem first. Teachers will make every effort to contact parents when a discipline problem occurs. Students violating class or school rules could be subject to a contract violation. Every teacher has the right to teach. Every student has the right to learn in an orderly and safe environment. No student has the right to disrupt the learning environment of the classroom. When a student chooses to attend Reuther Central High School, he/she agrees to sign and abide by a student contract. When a student makes choices which are in violation of the contract he/she signed the student risks the possibility of losing the privilege of attending Reuther Central High School. A Student Assistance Program is available to help students experiencing problems with tobacco, alcohol, or other drug abuse. This program offers students an opportunity to address their concerns in a confidential and non-punitive way. Any student can refer himself/herself to this program or be referred by anyone who is concerned about a student. Students referred to this program through a non-disciplinary referral will not be punished and will be offered help in dealing with any problem related to alcohol, tobacco, or other drugs. This voluntary program is available to all students. Any parent who would like more information about this program or prefer their child not participate in this program should contact the school principal. See Student Assistance Program Coordinator for more information.